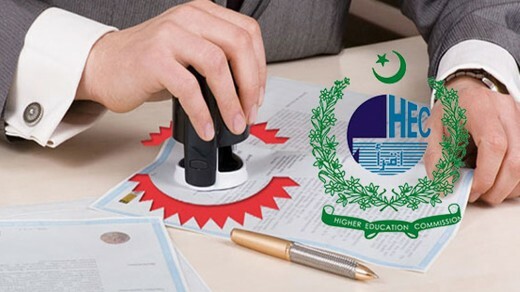 The Higher Education Commission (HEC) has changed the policy for the attestation of the degrees as the applicant for the attestation will not need to submit the information regarding their previous academic qualifications. HEC has issued the notification, according to which the degree will be attested on its merits. The notification is added that it was notified that the competent authority decided that every degree will be attested solely on the merit, whether it has the issued by the recognized institution and the institution has the legal authority to issue this degree. Applicants for attestation will not need to submit information regarding previous or subsequent academic qualification. The degrees, which are issued by the HEC recognized institutions in the subjects, in which they are authorized to issue the degree through their campuses or colleges to offer the relevant program, which can be verified, attested or equated. The degrees, which are issued by the unrecognized institutes or from the unauthorized campuses or colleges and / or in the unauthorized subjects will not be attested, verified or equated. It is further added that all other codal formalities are adhered as per prevailing SoPs for the processing of the cases of the attestation or the equivalence and these degrees are issued with the approval of the competent authority.